Thank you for your interest! You can view the webinar recording below, or access the materials at the bottom of the page. 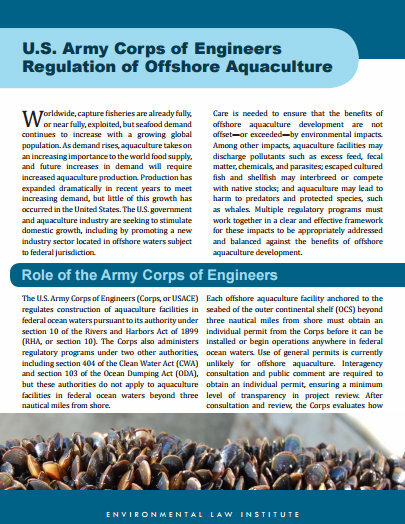 Most offshore aquaculture facilities require a permit from the U.S. Army Corps of Engineers under Section 10 of the Rivers and Harbors Act—and in some cases, this permit will be the only one required under federal law. 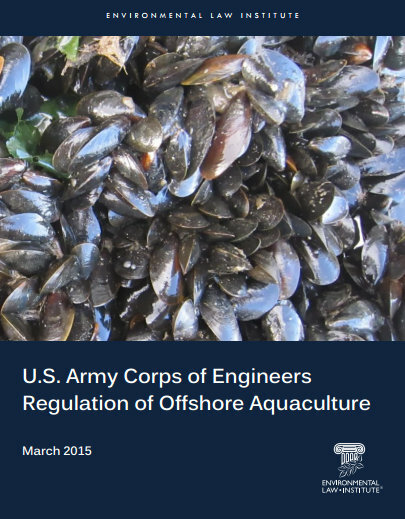 ELI’s white paper, U.S. Army Corps of Engineers Regulation of Offshore Aquaculture, provides a detailed legal and practical overview of Corps regulation of offshore aquaculture, illustrated through case studies of three offshore aquaculture projects that have recently received Section 10 permits. In addition, it provides recommendations for steps to increase the consistency and timeliness of Section 10 permitting of offshore aquaculture while ensuring that all environmental impacts are effectively addressed. This webinar featured presentations on the content and recommendations of the white paper, along with presentations and reactions by experts from the Army Corps of Engineers and Salem State University’s Northeastern Massachusetts Aquaculture Center. This event is made possible by generous support from the Naomi & Nehemiah Cohen Foundation and the Curtis and Edith Munson Foundation.